Text and Authority in the South African Nazaretha Church tells the story of one of the largest African churches in South Africa, Ibandla lamaNazaretha, or Church of the Nazaretha. Founded in 1910 by charismatic faith-healer Isaiah Shembe, the Nazaretha church, with over four million members, has become an influential social and political player in the region. Deeply influenced by a transnational evangelical literary culture, Nazaretha believers have patterned their lives upon the Christian Bible. They cast themselves as actors who enact scriptural drama upon African soil. But Nazaretha believers also believe the existing Christian Bible to be in need of updating and revision. For this reason, they have written further scriptures - a new 'Bible' - which testify to the miraculous work of their founding prophet, Shembe. 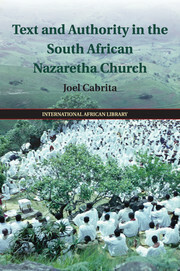 Joel Cabrita's book charts the key role that these sacred texts play in making, breaking and contesting social power and authority, both within the church and more broadly in South African public life. 1. Introduction; 2. Scholars, subjects and sources: ecumenicism and literary collaborations in the Nazaretha church; 3. Charting a changing literary landscape: Isaiah Shembe and the early Zion Movement in South Africa; 4. Transcription services: young literates and the transformation of generational relations; 5. The imitation of Christ: healing performances and Biblical spectacles; 6. Reading from the same page: Bible-writing and the creation of orthodoxy; 7. Tales of war: women's testimonies and the crafting of heroic reputations; 8. God loves this chief of ours: oratory and casting political obedience as religious obligation; 9. Pursuing recognition: rhetoric and reality in Church-state relations; 10. Conclusion. Joel Cabrita is University Lecturer in World Christianities at the University of Cambridge.